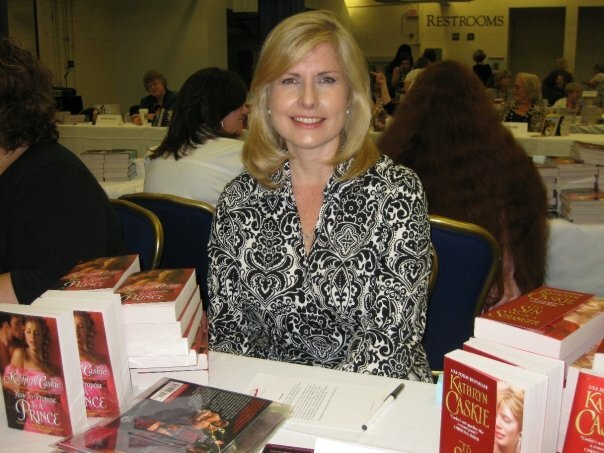 The world of romance lost a shining light last week with the death of historical romance author Kathryn Caskie. Not only was Kathy a gifted author but she was also a warm, funny, generous woman who greatly appreciated her readers. I enjoyed her books, had fun 'chatting' with her online, and had the pleasure of meeting her in person at various events. Kathy and her best friend, and fellow author, Sophia Nash were a dynamic duo who could light up a room with their wit, charm, and smiles. You simply couldn't be around them without smiling in return. That's how I want to remember her. She was taken from us too soon but her smile, her joy, and her stories will remain in the hearts of those of us whose lives she touched. of Kathy's life. All are welcome:"
My condolences to the family and romance community. So sorry for everyone's loss. What a devastating loss to her family, friends, fans and the romance community. I have some of her books, one even signed by her. May she rest in peace. So sorry for your loss, her family and the romance community. This just breaks my heart. The world lost a very talented and lovely lady. So sad. My prayers go out to friends and family. Thanks for the information. I was saddened when I read she had died. My prayers go out to her family and friends. Thank you for this post with the info. My prayers go to Ms Caskie's friends and family. Thank you for the information. What a sad loss of a lovely lady. She leaves a hole for her family and the Romance community that will take a long time to heal. Condolences to the family, friends and romance community for the loss of Kathryn Caskie.